BUYSOUNDTRAX Records presents the original soundtrack to TAG: THE ASSASSINATION GAME, featuring music composed by Craig Safan (THE LAST STARFIGHTER, SON OF THE MORNING STAR) for the 1982 action thriller directed by Nick Castle (THE LAST STARFIGHTER, THE BOY WHO COULD FLY, starring Robert Carradine (REVENGE OF THE NERDS, WAVELENGTH), Linda Hamilton (BEAUTY AND THE BEAST, THE TERMINATOR), Kristine DeBell, Perry Lang, John Mengatti, Michael Winslow, Frazer Smith, Xander Berkeley and Bruce Abbott (RE-ANIMATOR). TAG: THE ASSASSINATION GAME tells the story of a group of college students involved in a game where players try to eliminate each other using mock weapons in until there is only one player left. In the latest round of TAG, one player becomes so fixated on winning that he swaps his suction dart gun for the real thing and begins killing off the competition. Robert Carradine plays Alex, a college student who doesn’t play TAG but enamored with Susan, a beautiful student who finds herself becoming a TAG finalist. Susan is played by Linda Hamilton, in her first feature film starring role. Bruce Abbott plays Gersh, the master TAG player who goes off the rails and begins killing the other players. TAG: THE ASSASSINATION GAME was the directorial debut of Nick Castle, an associate of John Carpenter and who played the role of Michael Meyers in the original HALLOWEEN and who co-wrote the script for ESCAPE FROM NEW YORK with Carpenter. Castle’s script for TAG: THE ASSASSINATION GAME, originally called ‘Everybody Gets It In The End’, was based on a popular college campus game of the day called Assassin. Castle envisioned the film as a modernistic film noir, with Alex and Susan as a modern day Bogart and Bacall and the film evolved into an engaging hybrid of film noir, old-school romance and slasher-movie suspense elements. Castle’s vision for the film carried over in the film’s major aural component, it’s musical score. Recommended by fellow composer Elmer Bernstein, Craig Safan was hired to score the film and thus began a fruitful director/composer collaboration that continued on subsequent projects. 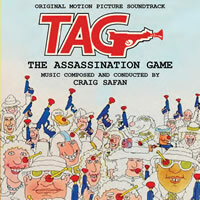 Craig Safan’s score for TAG: THE ASSASSINATION GAME was built around three primary ideas that matched the main stylistic elements of Castle’s visual architecture for the film. The film’s opening sequence was designed as an homage to the James Bond films of the day and Safan’s music has a jazz/boogie element to it. For Alex and Susan, Safan chose to write music in a kind of 1940’s jazz style, complete with writing for solo trumpet. For the film’s stalk-and-shoot sequences, Safan chose to write music in an orchestral style similar to the approach used in the the slasher movies of the day. TAG: THE ASSASSINATION GAME’s score was recorded with a moderately-sized orchestra of about 45-50 players. The score is primarily orchestral, with a few subtle electronic embellishments from synthesizer, performed by Safan’s frequent programmer, Michael Boddicker. In addition to the film’s underscore, Safan was responsible for composing and recording the source music heard from radios, parties, and the like. Most unique among Safan’s source music for TAG: THE ASSASSINATION GAME is the song “Easy With You,” which Safan wrote with multiple Academy Award-winning and Broadway lyricist Sammy Cahn. Craig Safan has composed music for numerous feature films, television shows, theatrical musicals, and circuses. He is the winner of eight ASCAP Top Show Awards as well as an Emmy nominee. Craig is also a recepient of a Watson Foundation Fellowship and is a member of the Executive Music Committee at the Academy of Motion Picture Arts and Sciences. Currently Craig divides his time between Los Angeles and New York City where he is developing several new musicals. BUYSOUNDTRAX Records presents the world premiere soundtrack release of TAG: THE ASSASSINATION GAME, featuring music composed and conducted by Craig Safan, mastered by James Nelson of Digital Outland. The booklet contains liner notes written by noted author Randall D. Larson and includes comments from the composer. TAG: THE ASSASSINATION GAME is a limited edition release of 1000 units. The first 100 copies sold through our website will include a booklet autographed by composer Craig Safan. 7. Rug Pull/What Do You Want? 11. She's a Psychology Major! 14. Can I Borrow Your Gun?